While most of us were cleaning our houses in anticipation of the wave of Thanksgiving visitors, MediaPortal fans were busy jumping on the alpha bandwagon with the release of the MediaPortal 2 Alpha 1 Autumn release. The MediaPortal team teased the MP2 Autumn release last month. The Autumn release is noticeably more stable than the MP2 Summer release and with support for movie collections and .nfo metadata files, MediaPortal 2 is starting to feel like a complete media center package. There are still some obvious feature gaps, but then that is to be expected with alpha software and anyone interested in the future direction of MediaPortal should definitely give the new release a try. 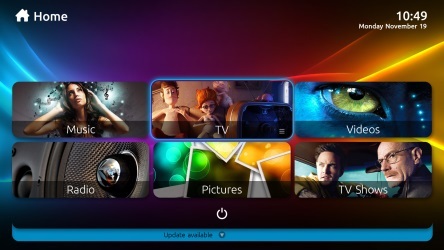 Team MediaPortal is proud to release yet another alpha of the upcoming HTPC revolution – MediaPortal 2! A lot of work has been done since the summer release of MediaPortal 2. While MediaPortal 2 might not be ready for most people’s full-time HTPC, there is still MediaPortal 1.3.0 to look forward to. At the same time that the MediaPortal team was teasing the MP2 Autumn release, they were also announcing that MediaPortal 1.3.0 would be coming with a new deafult skin named Titan. The team has announced that the MediaPortal 1.3.0 beta is in final testing and they are stoking anticipation with more images of the Titan skin and talking up Titan Extended, a version of the Titan skin equipped to extend the Titan experience to compatible MediaPortal extensions. As MediaPortal 2 development has creeped along, the most striking improvement over MediaPortal 1 has been the visual upgrade, but with the latest collection of Titan screenshots, the MediaPortal team looks to change things rather dramatically. A few of you might feel a sweet shiver crawling down your spine after reading that news title. I am extremely happy to announce that after many months of hard work, MediaPortal 1.3.0 Beta is in final testing! So the release is now very close!